Leslie Basham: Throughout the book of John, Jesus stressed that He was on earth to do His Father's will. Why did Jesus submit to the Father when He was talented, wise, and capable of making his own decisions? Dr. Wayne Grudem: The idea of headship and submission never began; it has existed eternally in the relationship between the Father and the Son in the Trinity. It exists in the eternal nature of God Himself. Leslie Basham: It's Thursday, May 19th. This is Revive Our Hearts with Nancy Leigh DeMoss. Here's Nancy. Nancy Leigh DeMoss: Do you remember that passage in the book of Hebrews where the writer says that we need to learn, not only to handle the milk of the word, but we also need to grow up and become spiritually mature enough to handle the meat of the word (Hebrews 5:12). That meat refers to some of those harder doctrines, those more complex, challenging parts of God's word. On today's broadcast we are going to be handling some of the meat of the word. In fact, if I could change the metaphor, I want to encourage you to put on your seatbelt because we are in for a ride here. I will be the first to admit that what we are talking about today is not something that's necessarily easy to understand, but I think it is very important. We have been listening to Dr. Wayne Grudem, who is a professor at Phoenix Seminary in Scottsdale, Arizona as he gave a message to a conference about a year and half ago called Men and Women: Similarities and Differences. He's helping us understand that not only are men and women equal in value and dignity in God's sight but that biblically they also have different roles in marriage and in the church. As we pick up with today's segment of Dr. Grudem's message, he is going to help us understand that this thing of headship and submission in the marriage relationship is not a negative concept. This is not a concept that changes with the culture. This is something that is rooted in the very nature of God. It's rooted in the Trinity, and the relationship that God the Father, God the Son, and God the Holy Spirit have with each other. If we dislike or reject the concept of authority and submission, we are actually rejecting something very precious that's a reflection of God Himself. 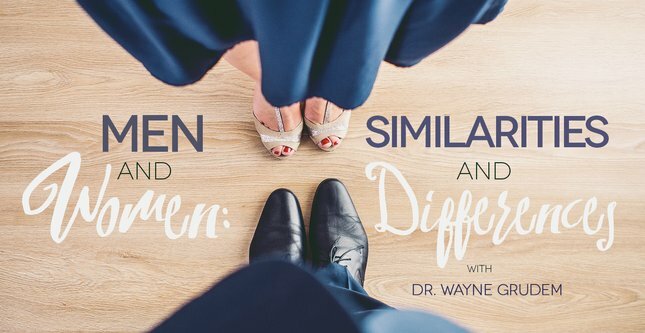 Let's join Dr. Grudem as he explains this key issue number three in his message, Men and Women: Similarities and Differences. Dr. Wayne Grudem: Key issue number three. The equality and differences between men and women reflect the equality and differences in the Trinity. There is much more at stake in this issue of manhood and womanhood than just how we relate as men and women. Here we are talking about the nature of God. I want to look at 1 Corinthians 11:3, 1 Corinthians 11:3, "I want you to understand that the head of every man is Christ, the head of a wife is her husband, and the head of Christ is God." Here we are talking about a difference in the role between the Father and Son in the Trinity. The other power point chart is a chart of two circles that I want to look at with you for just a moment. Here we have the Trinity: Father, Son, and Holy Spirit. The arrow from Father to Son indicates what 1 Corinthians 11:3 says, "The head of Christ is God." And the arrows down to the Holy Spirit mean that both the Father and Son have authority over the Holy Spirit. It has been that way since the beginning of time. In creation, the Father spoke, and the Son was the powerful created word through whom the Father created. "All things were made through him," says John 1:3, "without him was not anything made that was made." It was that way in redemption. The Father sent the Son into the world. If you don't know any verse in the Bible, except John 3:16, it shows this. "God so loved the world that he gave his only Son." Well, the Father had to be Father and the Son had to be Son before the Father could give the Son, and the Bible never reverses those things. The Son didn't send the Father to die for our sins. The Holy Spirit didn't send the Father to die for our sins. It was the Father who sent the Son. The Father created through the Son. The Father then redeems us by sending his Son. 1 Corinthians 15:28 says in the future, in the age to come, "When all things are subjected to Christ, then the Son himself will also be subject to him who subjected all things to him, that God may be all in all." The Bible several times says that Jesus sits at the right hand of the Father, but He's at the right hand. He sits with Him on His throne. He has equal glory and equal honor but not equal authority. The Father and Son are equal in all their attributes, and the Holy Spirit is too. But among those persons of the Trinity, though they are equal in all their attributes: infinitely wise, infinitely powerful, infinitely loving, just and merciful, omnipresent and omniscient; they share all attributes, but there is a difference in the way they relate. The Father has an authority that the Son does not have. So Paul says, "The head of Christ is God." He puts that in the same verse as he says, "The head of a wife is her husband" (Ephesians 5:23). That is a parallel between the Father and Son in the Trinity. In this case, the wife is taking a role that is parallel to the role of the Son in the Trinity, and the husband is taking a role that's parallel to the role of the Father in the Trinity. Is there equality in deity between Father and Son? Yes. Is there equality in importance? Yes. Is there equality in honor and value? Yes. Is there difference in role? Yes. So this means that the idea of headship and submission did not begin with something called the Council on Biblical Manhood and Womanhood in 1987. The idea of headship and submission did not begin with a few patriarchal men in a patriarchal society in the Old Testament. The idea of headship and submission did not begin with Adam and Eve's fall into sin in Genesis 3. The idea of headship and submission did not even begin with the creation of Adam and Eve in Genesis 1-2. The idea of headship and submission began before creation in the relationship between the Father and Son in the Trinity. The Father has a leadership role and authority to initiate and direct that the Son does not have. Ephesians 1:4 goes back before creation. Ephesians 1:4 says: "He chose us in him before the creation of the world." He, the Father, chose in Him, the Son, before the creation of the world. The Father chose us in the Son before the creation of the world. That means the Father was Father; the Son was Son. They had already planned in that uniqueness of their relationship. They had planned that redemptive pattern. Romans 8:29, "Those whom he foreknew he also predestined to be conformed to the image of his Son." Predestination occurred before the beginning of the world. "For those whom he foreknew (before creation), he predestined to be conformed to the image of his Son." That means the Father was Father and the Son was Son before the world was created. When did the idea of headship and submission begin? The idea of headship and submission never began. The idea of headship and submission never began. It has existed eternally in the relationship between the Father and Son in the Trinity. It exists in the eternal nature of God himself. And in this most basic of all relationships, authority is not based on gifts or ability. Father, Son, and Holy Spirit are equal in all attributes and perfections, but authority is just there. Authority belongs to the Father, not because He is wiser or a more skillful leader, but just because He is Father. Authority and submission is the fundamental difference between the persons of the Trinity. They don't differ in any attributes but just how they relate to each other. That relationship is one of leadership and authority and voluntary, willing, joyful submission to that leadership and authority. We can learn from this. We can learn that submission to an authority is a noble virtue. It is privilege. It is something good and desirable. Submission to an authority is the virtue that has been demonstrated by the eternal Son of God forever. It is His glory. It is the glory of the Son as He relates to the Father. We tend to think if you are an authority, if you're boss, that's good. If you submit to authority, that's bad. But that's the world's view point. It is not true. Submission to authority is itself a good thing. I am not talking about abuse of authority, distortion of authority but submission to a rightful authority. Authority and submission with mutual giving of honor is the most fundamental and most glorious interpersonal relationship in the universe. It allows there to be personal differences without better or worse, without superior or inferior. I don't like those Benetton billboards that just say, "Resist authority." I just look at that and say, "Friend, that idea did not come down from heaven." When we begin to dislike the very idea of authority and submission, not distortions and abuses, but the very idea of authority and submission we are tampering with something very deep. We are tampering with and we are beginning to dislike God himself. Now, this creates a problem for our egalitarian friends because out of those 117 objections, or whatever I have in this book, many of them are variations on this theme, "if you are equal you can't be different, if you are different you can't be equal." They can spin that out in many, many, many, many ways--a lot of permutations. Egalitarian friends who say, "If you have male headship, then you can't be equal as husband and wife. And if you are equal as husband and wife, then you can't have male headship." We say in response, "You can have both. Look at the Trinity." They should have said, "Okay, in God you can have equality and differences, but it's different in human relationships." Some such as my friend, Craig Kenner, have said that. But many prominent egalitarians have taken a different direction, and it's very troubling. Gilbert Bilezikian and Stanley Grenz, Bilezikian has just retired from Wheaton College, Stanley Grenz of Regent College in Vancouver, and some others are teaching mutual submission within the Trinity. So they wouldn't have an arrow going just from the Father to the Son; they would have an arrow going back from the Son to the Father as well. They say, "Okay, the Son submits to the Father. You know what, we think the Father also submits to the Son." Though there is no passage in the Bible that says this. This has never been the orthodox teaching of the church throughout 2,000 years, but now they are saying it. So deep is their commitment to an egalitarian view of men and women in marriage that they will tamper with the doctrine of the Trinity if necessary in order to maintain it. Leslie Basham: That's Dr. Wayne Grudem, helping us understand that biblical marriages are important. When you accept your role in marriage, you are reflecting the nature of the Trinity. If you have been intrigued by today's message, but are still trying to understand it, I hope you'll get a copy of a booklet written by Wayne Grudem and John Piper called Fifty Crucial Questions. It'll help you think through some of the issues that we've heard today. When you order the booklet from us, we will send you a free study guide based on the message we've been hearing from Dr. Grudem this week. To order call us at 1-800-569-5959. That's 1-800-569-5959. You can also order the booklet on-line at ReviveOurHearts.com. The study guide is there as a free PDF download. You are not going to hear the message like the one we heard today in very many places. If you are glad that we are helping people discover a biblical view of roles in marriage, would you consider helping us? We're able to be on the air because our listeners give. Differences between men and women are good. We will talk about it tomorrow. We hope you can be back for Revive Our Hearts. Revive Our Hearts with Nancy Leigh DeMoss is a ministry outreach of Life Action Ministries. All Scriptures are taken from the English Standard Version unless otherwise noted.